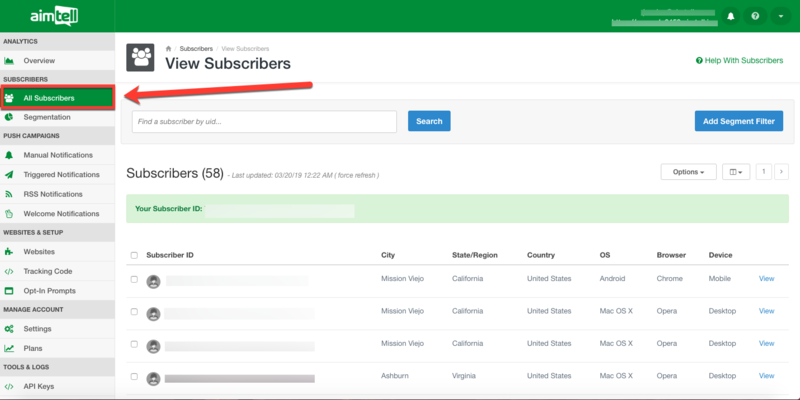 You can view information about an individual subscriber by selecting "All Subscribers" under the left hand "Subscriber" field on your dashboard. You can view detailed information about any listed subscriber by clicking on "view" on the far right hand side, next to the 'Device' column. Each tab will provide you with additional details regarding the individual subscriber. idSite - the value is simply the website ID for the website the user opted in on. subscriber_uid - the individual subscribers identification number. gcm_id - a key that google uses and attaches to this individual subscriber in order to export this subscriber if you chose to do so in the future. custom_prompt_id - the id of the prompt that this individual subscriber clicked to opt-in to push notifications for your site. createdAt - when this individual became a subscriber. initial_action - whether the individual subscriber opted in the first time they saw the opt-in prompt. action - this is the current individual subscriber opt-in status. To further explain "initial_action" and "action"' - If your individual subscriber approved push on a Monday, then changed their mind and opted out later that week the "initial_action" would show granted but the "action" would be denied. Under the "Pages" tab you can see every page on your site that this individual subscriber has visited, as well as the date they have visited. idSite - once again, the value is simply the website ID for the website the user opted in on. subscriberId - the individual personal identification number. browserLang - the language of the default browser of this individual subscriber. browserName - which browser the individual was using. OperatingSystemCode - simply the individual's OS. deviceType - the device the individual was using. ip - the individuals ip address. region - the individuals state. city - the individual's city. county - the individual's country. alias - the individual's associated username or email. These are the notifications that this specific individual has received. *Please note: The Pages and Notifications tabs only show the most recent 10 pages and notifications. Custom attributes allow users to add a custom information (eg name, age, gender) to an individual subscriber. These custom attributes can be used for segmentation and dynamic notifications. Custom events allow users to track any event (eg item purchased, abandoned form, user registration) on the site back to the individual subscriber. Custom events can be used for sending triggered notifications or conversion tracking.